It’s good practice to organise your plugins – well it is for me. You can always filter and search for a plugin, but sometimes the amount of plugins you have can mean that you overlook certain plugins that are within your arsenal. First you’ll need Reaper up and running. 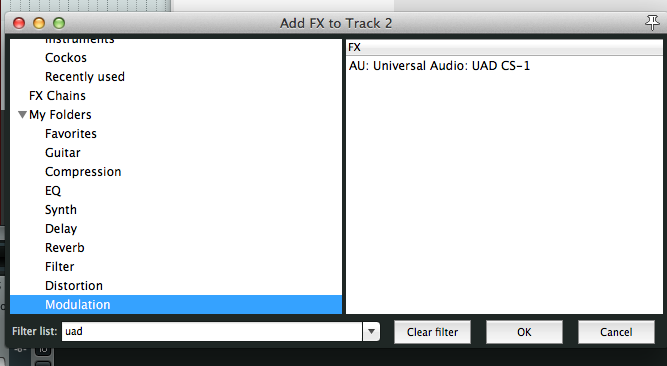 Next add a track and click on the ‘FX’ button. 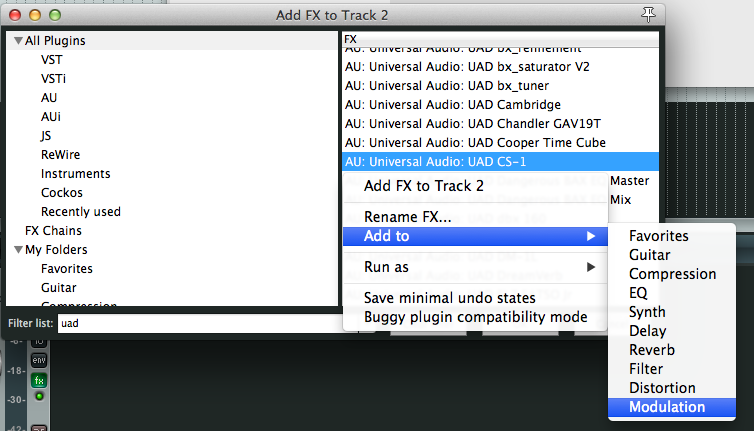 This will open up the Reaper FX browser. Scroll down to ‘My Folders’. Using the right click on your mouse you can create your own folder. As you can see I already have some folders created. Let’s create a new one. The new folder will now be ready for plugins. You can also organise these folders by moving them up and down, to the top or to the bottom. 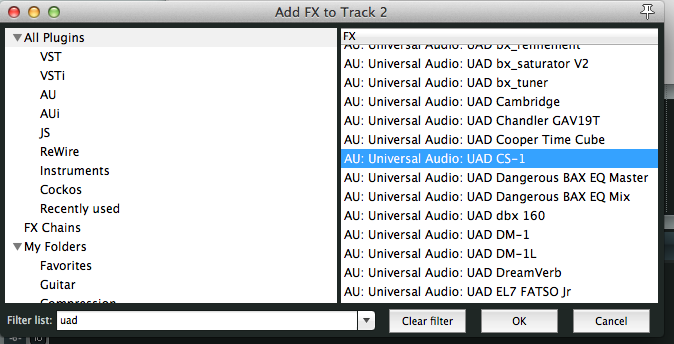 Once you have your new folder you can start to add your plugins. You can search for plugins either by the browser or if you know it’s name or a search word then you can use the filter feature. 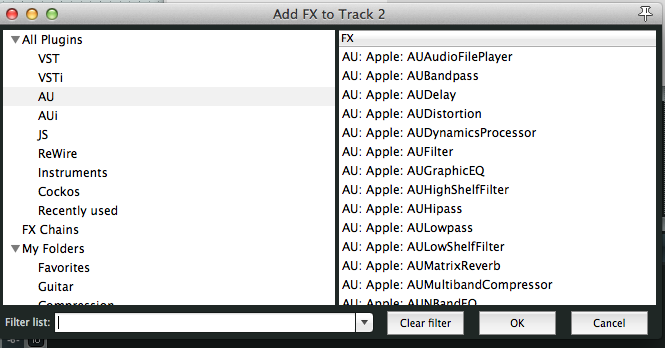 Underneath you can see there are plugins for VST, VSTi, AU, AUI, Js etc. If you know specifically the type of plugin then you could probably go into the that folder. 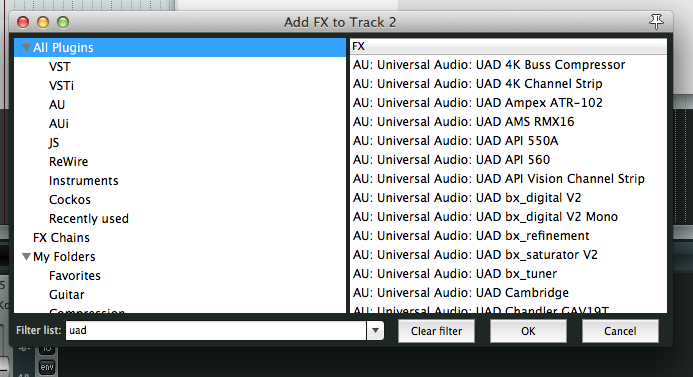 As you can see from the screen shot, in the ‘Filter List’ I have typed ‘had’ and this has brought up all my UAD plugins. I’m looking for a specific plugin called the CS-1. Use the right click on your mouse, this will bring up and option to ‘Add to’ and then you have a choice of your plugin folders. 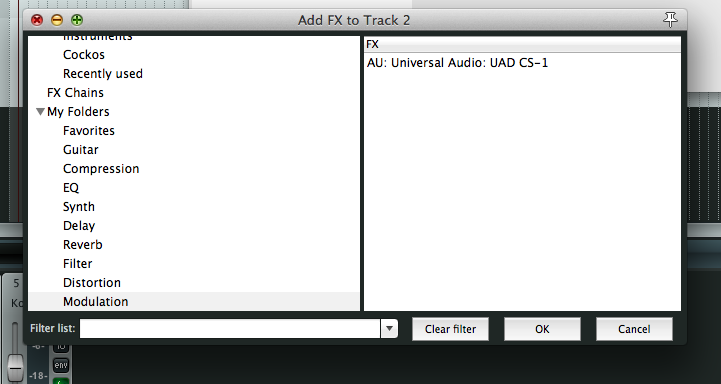 As this particular plugin is a chorus effect I’m going to add it to my newly created, ‘Modulation’ folder. Once done we can check that it has moved over successfully. Go to the ‘Modulation folder. Hopefully all being we’ll you should now see the plugin in that folder. 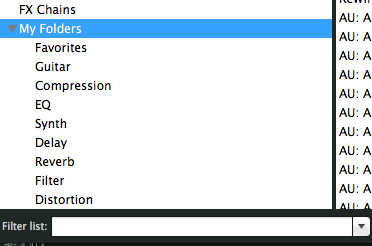 Ah, did you see, I forgot to clear my ‘filter list’ – not that it matters but hey t’s something that you need to be careful of. 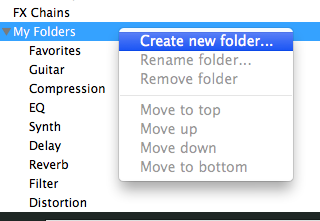 You cannot make sub folders – which is a shame but not the end of the world.